The name of the game is protein. 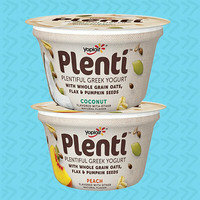 A cup of this yogurt has over 20g protein but a nice low calorie count. And luckily, Greek yogurt is basically everywhere these days! We recommend always keeping a tub of the plain stuff on hand; it is SO versatile. (Click 'n see.) And those single-serve containers make great grab 'n go snacks. If you're looking for even more hunger-squashing power, look to products like Chobani Oats and Yoplait Plenti -- they have grains and more mixed right in. Fiber time! There's a reason oatmeal makes a perfect breakfast -- you've gone all night without eating and need something that's going to power you through the morning. The blend of soluble and insoluble fiber makes oats extremely filling... especially if you cook them into a signature HG growing oatmeal bowl. Another perk to plain old-fashioned oats? They're inexpensive. And if you want to bump up the filling factor, stir in some protein powder. 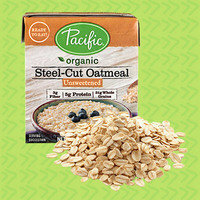 If you need quickie options, look for products like Pacific Organic's ready-made Unsweetened Steel-Cut Oatmeal, BetterOats Oat Fit, and Quaker Protein Instant Oatmeal. Yay, oats! Another protein superstar! But it's not just the protein content that matters here -- it's the amino acids. Specifically leucine, which has been linked to increased satiety and obesity-fighting potential. If you're going to use whole eggs, stick to smart recipes like this tostada or this breakfast hash, which call for just one large egg to keep calorie counts down. If you want a full-on omelette or large scramble, go for fat-free egg substitute or egg whites and maybe one yolk. 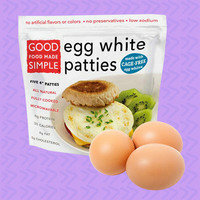 There are also some ready-made egg finds that are great in a pinch: Cedarlane's Egg White Omelettes, Good Food Made Simple Egg White Patties, and Evol. Scramble Cups, to name a few. This cruciferous veggie is white-hot right now. Its carb-swapping prowess cannot be overstated! What makes cauliflower so satisfying? You can eat a LOT of it for a low number of calories and a high amount of fiber. So instead of a small serving of white rice, you can have a giant bowl of cauliflower rice. 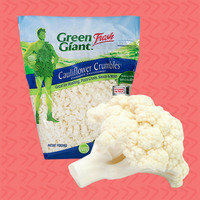 (Shortcut alert: Check out Green Giant's fresh Cauliflower Crumbles and Trader Joe's Riced Cauliflower, which comes both fresh and frozen!) And you can use it to bulk up all kinds of dishes, from mashed potatoes to mac 'n cheese. When it comes to the magical satiating combo of protein and fiber, the mighty bean comes to mind. This study even found that beans are as satisfying as beef; good news for anyone considering cutting back their meat consumption. And basic beans are super affordable -- a great way to fit nutritious food into your budget. We have a ton of bean-packed recipes in our database... including desserts! 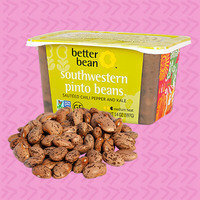 And if you want to buy some of the yummiest seasoned beans around, you must try the picks from Better Bean. It may not be as flashy as some other supermarket food finds, but PEOPLE: Do not forget about soup. It's been noted that eating broth-based soup at the top of a meal leads to taking in fewer calories during the meal (and your day!) overall. Soup also makes a terrific light snack. 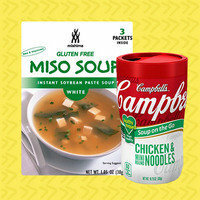 Dried miso soup packets are good additions to your at-work snack stash, as are microwaveable single-serve soup containers, like this heart-healthy one by Campbell's Soup on the Go. And Pacific Foods makes some seriously interesting broths and stocks -- check out the lineup! The OG of our beloved produce-based product finds. We've been batty about this mix of shredded broccoli stems for years. 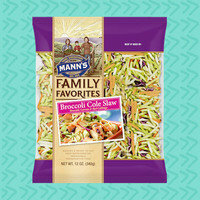 Why is broccoli slaw so satisfying? Three grams of fiber for every 25-calorie cup, that's why. Even better? This product is great raw and topped with dressing, steamed and topped with marinara sauce, mixed in to bulk up meatloaf, added to a simple stir-fry... There are a bazillion possibilities. Check out our recipes, or just get creative on your own! Satisfaction awaits. Today, March 11th, is National Oatmeal Nut Waffles Day. Van's 8 Whole Grains Lite Waffles have oats in the mix; spread one with a tablespoon of Justin's Maple Almond Butter for b-fast to go! We all need new tips 'n tricks -- click "Send to a Friend" to pass these around now!